The mid-range is fast taking the spotlight from the flagship, and Huawei’s Honor sub-brand is just one of the players aiming to offer premium specs at an affordable price. 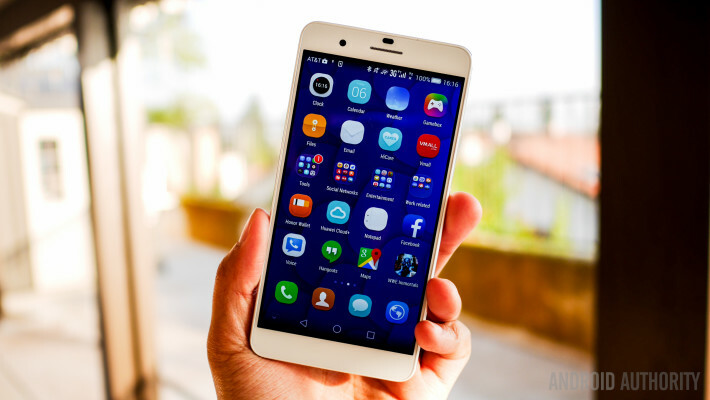 In the case of the Honor 7, the company has taken last year’s flagship Ascend Mate 7 and combined it with the Honor 6 Plus to create an affordable yet premium-feeling smartphone. The Honor 7 is one of those smartphones that aims to combine a premium build with impressive specs and an even more impressive price tag, but how does it compare to the Honor 6 Plus? Let’s take a look. The Honor 6 Plus is certainly an interesting smartphone thanks to its plastic finish that features a dot-matrix design and certainly looks cool, but the switch to a brushed aluminium finish on the Honor 7 makes the new handset infinitely more premium. At 8.5mm thick, the Honor 7 is 1mm thicker than the Honor 6 Plus but a tad lighter (157 grams vs 165 grams) and the added thickness does mean the handset is a lot more reassuring in the hand. Measuring 143.2 x 71.9mm, the Honor 7 is both smaller and narrower than the Honor 6 Plus – mainly due to the smaller screen – but this change in size means the handset is more manageable in the hand. The back of the Honor 6 Plus features a plastic finish and that quirky-yet-somewhat-odd dot-matrix design, and the biggest issue with this is the tendency to attract fingerprints. With the Honor 7, the switch to a metal finish means this is no longer an issue. The matte finish on the Honor 7 has been blasted with ceramic particles to give it a brushed effect that also provides grip and the change is most certainly welcome. An Honor executive told us that designing the finish on the Honor 7 required blasting ceramic materials at different blasting pressures in order to achieve the eventual finish. Beneath the camera is arguably one of the best features on the Honor 7: the fingerprint sensor. While fingerprint sensors are certainly not new, the Honor 7 brings an updated version of the excellent sensor that debuted on the Ascend Mate 7. The redesigned sensor is the first ever sensor on a smartphone not to feature a metallic ring around it, while Huawei has also added other features to it. Thanks to gesture support, the sensor can now act as a back button that, by simply tapping it, lets you return to the homescreen by pressing and holding the sensor, pull down the notification sensor by swiping down on the sensor and access the recent apps menu by swiping up on the sensor. The position of the sensor on the rear is such that it is where your finger naturally rests and you’ll find the gestures become very useful in day to day use. On the right, both smartphones feature the power and volume keys but a key change is that in the Honor 7, the keys are less recessed and have been crafted from ceramic, making them easier to locate and press without looking at the handset. Another change is that while the Honor 6 Plus features separate SIM and microSD card trays on the right, the Honor 7 combines these into one tray which is located on the left. Beneath the tray on the Honor 7 is another new addition in the form of a button called Smart Key, which lets you launch favourite applications or toggle certain system features. As an example, I have it set up that a single press launches Twitter, a double press takes a screenshot and a long press pulls up Google Now. All of these options are customisable and it’s a quick and easy way to access your favourite applications from any screen. To the bottom and another change as the Honor 7 houses a bottom-mounted speaker – like the all-metal Huawei P8 – while the Honor 6 Plus has Huawei’s older rear-mounted speaker design. The metal finish on the Honor 7 meant that Huawei couldn’t use a rear-mounted speaker and this is a change that has paid off with the Honor 7 monospeaker appearing to be much louder than the Honor 6 Plus. The Honor 7 is the follow up to the Honor 6 and not the Honor 6 Plus and features a 5.2-inch Full HD display, which is slightly smaller than the 5.5-inch panel found on the Honor 6 Plus. Both smartphones features the same Full HD resolution and the smaller panel on the Honor 7 delivers a slightly higher 424 pixels per inch density (versus 401 ppi on the Honor 6 Plus). Despite a slightly larger build, the Honor 6 Plus has a higher screen-to-body ratio than the Honor 7, with the larger handset delivering a 73.2% ratio, while the Honor 7 has a slightly lower ratio of 72.4%. As someone with large hands, the Honor 6 Plus was mostly manageable but the smaller size of the Honor 7 is definitely much easier to use. Like past Huawei smartphones, both the Honor 7 and the Honor 6 Plus are powered by Huawei’s own HiSilicon Kirin chipsets but a key difference is in the chipset being used. The Honor 6 Plus sports a Kirin 925 SoC with 2GB RAM while the Honor 7 is the first smartphone (apart from the Huawei P8 Max) to use the new Kirin 935 SoC with 3GB RAM. Both handsets use octa-core Cortex processors in a big.LITTLE formation and while the Honor 6 Plus uses the older Cortex A-15 and A-7 cores (clocked at 1.8GHz and 1.3GHz respectively), the Honor 7 uses the newer Cortex-A53 cores, with four cores clocked at 2.2GHz and four more at 1.5GHz. The Honor 6 Plus is certainly no slouch in the performance market but an extra gigabyte of RAM coupled with the much improved processor and the newer and faster Cortex-A53 cores delivers much better performance on the Honor 7. Both smartphones also come with expandable storage, which lets you expand the 16/32GB storage on the Honor 6 Plus or the 16/64GB storage on the Honor 7, and like past Huawei devices, the microSD card tray can also be used as a dual SIM card slot. It’s worth noting that the 64GB storage variant of the Honor 7 is currently only available in China with Huawei yet to confirm if this will be made available elsewhere around the world. Having the option to use two SIM cards definitely makes both of these devices a lot more appealing, but only one SIM card can be used for LTE, with the other limited to just voice or SMS. While this is somewhat disappointing, it’s unsurprising given the price tag and it’s certainly nice to have dual SIM functionality if you are someone who uses two different SIM cards. Both smartphones feature non-removable batteries, which is unsurprising as it’s a trend that most manufacturers are adopting in their devices. The Honor 6 Plus features a 3,500 mAh battery but despite the extra thickness, the Honor 7 actually drops the battery life by 400mAh, although the 3,100 mAh battery is by no means small. The Honor 6 Plus has impressive battery life and it is hoped that the Honor 7 also delivers on the battery front, despite the smaller battery size. Huawei itself claims the battery can last 2.57 days with moderate usage or over 1.2 days with heavy usage and to see whether it lives up to these claims, we’d recommend checking out our full Honor 7 review. The Honor 7 is also the first Huawei smartphone to come with fast charging built-in. Huawei says the fast charging lets you charge for five minutes’ to make an hour’s worth of calls and can charge to 50 percent in just 30 minutes. It’s worth noting that the fast charger isn’t included in the box due to the lower price tag but it shouldn’t cost too much to buy as an after-market accessory. Both handsets also support reversible charging that lets you charge another phone using a USB-On-The-Go cable but the cable isn’t included in the box and you’re unlikely to use this with the smaller Honor 7 battery capacity. A key problem with metal devices is signal interference but Huawei has solved this with a dual antenna design that intelligently switches between antennae in a micro second depending on which is providing the strongest signal strength. Alongside this, the Honor 7 also supports Wi-Fi+ technology, which aims to improve battery life by automatically disabling Wi-Fi and then re-enabling it when it recognises you are near a known Wi-Fi network. As you’d expect from a modern smartphone, the Honor 7 and Honor 6 Plus also come with a range of other connectivity options, including an infrared port to control electrical appliances, Bluetooth 4.0 LE to connect to wearable devices and LTE Cat 6, which offers download speeds of up to 300Mbps and upload speeds up to 50Mbps on the go. Arguably the biggest change between the Honor 6 Plus and the Honor 7 is in the camera, with Huawei opting to replace the dual cameras on the Honor 6 Plus with a more traditional single camera arrangement on the Honor 7, which protrudes from the rear but is protected by sapphire crystal to prevent scratching and damage. The camera on the Honor 6 Plus used two 8MP cameras to let you capture an image and then refocus the image after capture but this feature is dropped in the Honor 7. Instead, the Honor 7 uses a Sony IMX230 sensor to deliver 20MP resolution and all importantly, Phase Detection Autofocus (PDAF). Huawei says PDAF on the Honor 7 can focus on an image in just 0.1 seconds and is happy to show the feature off by detailing the time taken to focus in the viewfinder. The Honor 7 camera also comes with a range of camera features that debuted on the Huawei P8, include the Good Food, TimeLapse and light painting modes but Huawei has added to these in the Honor 7. The additions include a new demist filter to remove smog or fog from photos, a star tracking mode to capture the night sky and two additions to the light painting mode in the form of silky water and taillight tracking. To the front and both devices come with 8MP selfie cameras equipped with Huawei’s Beauty Mode feature. The Honor 7 takes it one step further with the addition of two other features. First, a new selfie light aims to let you take selfies in different lighting conditions and second, a new Perfect Selfie mode lets you pre-program your face and the Honor 7 will then replace your face with the pre-programmed image whenever you take a group selfie. There’s no denying that on paper, the Honor 7 camera is certainly impressive especially when you consider it an affordable smartphone and while it’s certainly not perfect, it delivers much better photos than the Honor 6 Plus. A key issue that many users have with Huawei devices is in the company’s Emotion UI interface, which is also known as EMUI and can sometimes feel like an incomplete experience. Just like the Huawei P8, the Honor 7 runs the latest EMUI v3.1 on top of Android 5.0 Lollipop while the Honor 6 Plus is still running the older Android 4.4.2 KitKat OS. As identified in our Huawei P8 review, there’s several elements that don’t quite make sense in EMUI v3.1 including a notification menu that duplicates notifications and a colour scheme that can make notifications difficult to read. Sadly, these also make their way to the Honor 7 but while Huawei hasn’t fixed all the little elements, it has added some interesting new features. The knuckle screenshot – which is absolutely atrocious on the Huawei P8 – has been improved so you can now double tap with your knuckle to take a screenshot and can completely turn off the feature in the settings. EMUI also now comes with a Fast screenshot setting that lets you double press the volume down button to launch the camera and coupled with phase detection autofocus, it should mean you won’t miss many shots. There’s also a hidden apps drawer, which lets you get rid of some of the icons on the homescreen by putting them in a hidden menu that can be accessed by pinching out. A good use case for this would be if you wanted to separate your work apps from your personal apps as you could hide the work apps and not need to see them once you leave the office. Sadly, Emotion UI still doesn’t come with an app drawer which most users will find quite jarring and while we’ve asked Huawei to introduce the feature via an option in the settings, it’s unlikely we’ll see it anytime soon. The beauty of Android is that you can change the launcher very easily and this should make the experience more enjoyable if you don’t like EMUI. Having tested Nova Launcher on the Honor 7, I can safely say that it runs smoothly and improves the experience somewhat. One of my favourite features on the Honor 7 aims to solve the infrequent yet common problem of losing your phone. With the Honor 7 you can now say a customisable voice command when you can’t find the handset and it will respond with a rather cheesy but cute response. The feature works rather well and although it can take a few attempts to set it up, it generally has no issues recognising the wake-up command. Emotion UI has certainly come a long way since past Huawei devices and while it’s not perfect, I find it somewhat manageable (although many others do not). It’s worth noting however that – at least in my personal opinion – the software experience should not deter you from the Honor 7, which is otherwise an excellent smartphone. The Honor 7 is launching in the UK today for just £249.99, which when you consider the specs, is an absolutely fabulous price. In comparison, the Honor 6 Plus costs a tad more at £299.99 and given the choice, I know which one of the two I would rather have. What do you think of the Honor 7 and the changes made by Huawei since the Honor 6 Plus? Let us know your thoughts in the comments below, don’t forget to check out our full Honor 7 review, hit subscribe and stay tuned to Android Authority.com because we are, your source, for all things Android. See you next time!